I recently demonstrated spell missiles and discussed the back-end framework driving magical effects in Daggerfall Unity. I’m happy to report that it’s now possible to create custom spells and hurl sparkling death at your foes! As my last article was a bit dry and technical, I’ll start this one off with a short video of spells in action. You’ll find all new test builds on the Live Builds page as usual. Here are the key features of this release. Create custom spells in the Spellmaker UI (invoke using “showspellmaker” from console). Spellbook UI where custom spells are saved with your character. Continuous Damage Health (a damage over time effect). Damage Health (a direct damage effect). Heal Health (heal yourself and other entities). All elements and target types are available (as appropriate for effect) when creating spells. Smooth crouching, head bobbing, and head rocking when damaged (Meteoric Dragon). Sound and music volume sliders (in progress). Some effects not wired up to volume slider yet (Meteoric Dragon). City Guards and crime tracking, starting work on Crime & Punishment (Allofich). More mod support in the back-end (TheLacus). While only 3x effects are available at this time, this doesn’t nearly do justice to the progress that has been made. Spell effects are actually very small scripts – usually no more than a few lines of code and some properties. 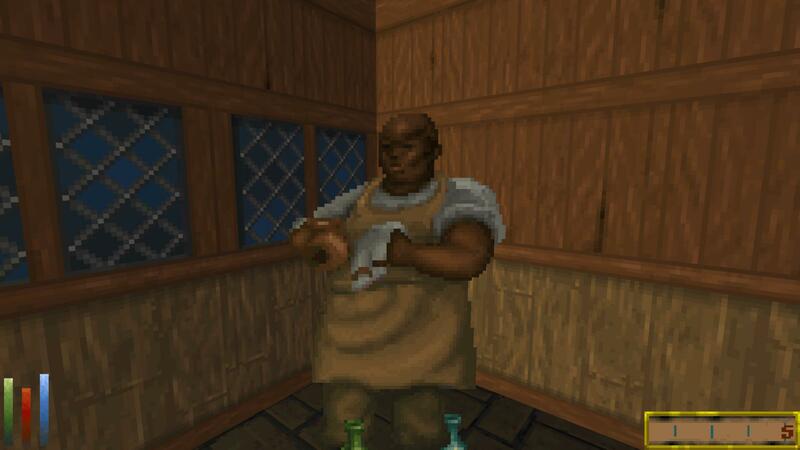 What really matters is the framework driving magic in Daggerfall Unity has finally progressed to this point. The previous article has more on this if you’re interested. The purpose of these builds is to test the magic & effects framework is well-behaved and usable in its current state. What I’m looking for are crashes and other unexpected behaviour in the framework. Once this is working well, I will continue to roll out more effects in future builds. To keep testing as focused as possible, here’s a summary of what you can expect from this release. Create and cast spells using the starting 3x test effects above. There is no spell absorption, reflection, or elemental resistance at this time. You can select elements to change appearance of spell and missile, but all elements are equal in terms of damage. All target types (caster, touch, target at range, etc.) should be working. Spells do not yet increase related magic skills of character. Spells are all currently free to buy and to cast – so make them as weak or powerful as you like. All of these free spells will be expired at some point closer to 0.5 stable. Magic items are not implemented yet, this will come much later in 0.5 cycle. Note: Due to changes in the modding system older mods may not work in this version. Please revert to build #105 for any broken mods until creators update for current version. For discussion on these builds, please head over to the forums. If you want to report a bug, post this to the Bug Reports forums. If you’re not sure if something is a bug or just not implemented, don’t hesitate to ask in Help & Support. I hope you enjoy this early preview of spells in Daggerfall Unity. Have fun! In my previous article, I showed progress on the visual side of spell-slinging and had lots of fun with casting animations and throwing around missiles with lighting effects. Now I have to regard the business end of the spell system and how all of this holds together under the hood. This article will be a lot more tech-oriented than my previous one, but may still be of interest if you’re curious about how spells will operate in Dagerfall Unity. Please keep in mind this is all under active development so concepts discussed here are likely to be refined or expanded by the time everything rolls out. One major shift in this process was changing how I think about the spell system. I have a long list of goals I want to achieve during this stage of development, above and beyond just emulating Daggerfall’s classic roster of spells. Primarily, I want to create a central way of handling the majority of effect-based gameplay. This means advantages/disadvantages, diseases, poisons, spells, magic items, potions, and so on should all come together under the one system or group of related systems. Once I had made that decision, it no longer made sense to call it the “Spell System” as spells are just one part of the collective. So the Magic & Effects System was born. This is why you won’t see the word “spell” very much moving forward but you will see the word “effect” a lot. In this context an effect isn’t something visual, it’s how something works. For example, an effect that heals the player is a script which increases their current health. This naming is taken from Daggerfall itself where spells and magic items reference effects directly using a type and sub-type. You can read more about classic Daggerfall’s spells and their effect indices on this UESP page. 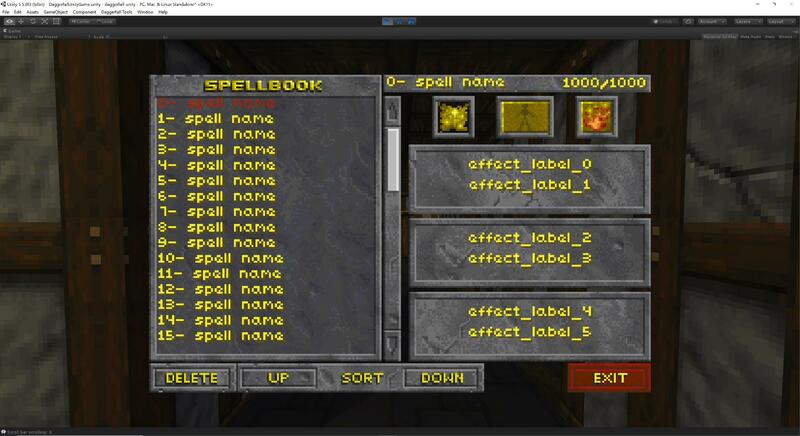 You will also see the term effect used by Daggerfall’s Spell Maker UI when creating a new spell. You can add up to three effects per spell as shown in screenshot below from classic Daggerfall (spell maker is not yet implemented in Daggerfall Unity). It’s finally time for spells to get the treatment and become a regular feature in Daggerfall Unity. I have decided to approach this feature-set in a more visual way than I did the quest system, which involved several months of back-end work before I could even show a single screenshot. This time around, I want the process to follow the visual diary approach from day one to make it more interesting to watch things unfold. This also helps me stay motivated as it’s a lot more fun to hurl around glowing balls of magical death than build a runtime compiler for the quest system. There will be some more code-oriented articles later in the series, but for now let’s take a look at the front-end graphics of spell-casting animations and missiles. Before I can do anything else, I have to implement the basic cast/recast loop. Thanks to Lypyl, a baseline spellbook interface is already in the game. It doesn’t have any actual spells yet, just some temp line items, but that’s all we need right now. I wired up the spellbook to the “cast” key (default is Backspace) so player can select a spell from their collection. It doesn’t matter which “spell” you choose at this point. Just double-click any item to let the game know you’ve selected something. A new round of Live Builds are now available with some great new gameplay and mod features to enjoy. Thanks to Hazelnut, it’s now possible to rent a room in taverns. And thanks to Allofich, you can also purchase food & drink for RP purposes. During your tenancy, you’ll be allocated a bed and can use that tavern as a home base. Just talk to any friendly bartender across the Illiac Bay. Rooms are saved with your character, so if you leave town and return later before your tenancy expires, your room will still be available. This all ties in perfectly with Hazelnut’s world persistence. You can leave loot piles in your room and return later to retrieve them. Just don’t forget to pick up your loot before your room expires or those items become property of the house. No refunds! Welcome to 2018 everyone! What a great few months we’ve had in Daggerfall Unity. Despite my general absence in November through December last year, work still continued on the project at an excellent pace. I owe a debt of thanks to everyone that continued adding features while I was out of the scene for several weeks. I want to make this post all about these contributions, and mention the people who contributed during that time. We’re close to a stable “Quests 0.4” build now before officially moving on to 0.5 and spells. “Stable” in this case doesn’t mean everything is complete or bug free – just that quests should be relatively steady and playable based on our current position in the Roadmap at the end of 0.4. Work will continue on improving and tightening up quest system all the way to 1.0, but now it’s time to move onto something new. This often means exciting new bugs to fix so the stable build stands as good fallback point if anyone is experiencing too many troubles with latest versions. That’s right! 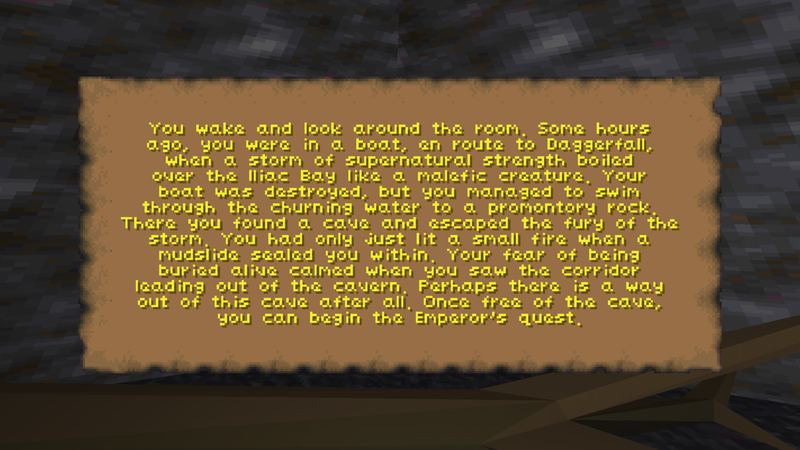 The main story quest in Daggerfall Unity is now completely playable from start to end. I’ve spent the last couple of months playing through the story quest, building out engine support, and fixing all the major bugs I could find. It’s true this game still has a distance to travel (spell system is next major journey) but this is a huge milestone in the project’s life cycle. It’s no longer fair to say Daggerfall Unity “isn’t playable yet”, that’s not even close to accurate anymore. And thanks to regular contributors like Nystul, Allofich, Hazelnut, and Lypyl, some of the later features on the roadmap are building out ahead of schedule. The quest system has consumed around a year of my development time to bring to this point. It represents the single largest group of features in the project so far, and drives almost every other gameplay system forwards. I feel confident in saying the magic system probably won’t be anywhere near as challenging. And once we pass that milestone, everything else is on the downhill run. After you grab the latest DragonBreak build from Live Builds page, there are two ways you can play through the main quest. You can either start a new character and play normally (using quests offered by any Fighters Guild to help level up between main quests) or use the “setmqstage n” console command to force the game to a specific point along the main quest process. There are 7 total quest stages, thus “setmqstage 1” through “setmqstage 7” are supported. Each stage is a chain of around two to six quests that represent a particular story arc in the game. If and when new problems are found with main quest, testers can quickly restart and test just that stage without playing through the whole game from the beginning. If you want to play the game as normally as possible, start a new character. Playing the game from start to end normally is also an important and time-consuming part of the testing process, so your time here is valuable, even if something breaks and you need to start again. But if you want to perform focused testing of the main quest, grab a high level character save and use the “setmqstage n” console commands. I’ll post more details in this forum thread as time allows. Please offer feedback in that thread or ask general questions, and post to Bug Reports forums with obvious bugs. The next step from here is to work towards a DragonBreak stable build and complete the 0.4 cycle. This might take several weeks as the main quest is a massive and complex system, there’s no telling what problems testers might run into. Once the stable build is ready, work will proceed on the spell system and 0.5. 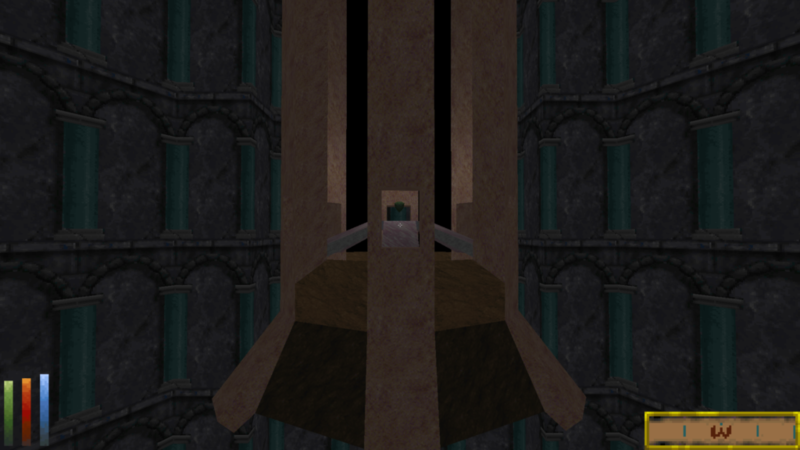 I also want to thank all of Daggerfall Unity’s contributors, supporters, mod-creators, and community members. You are all responsible for this project’s momentum, and for keeping morale high during those bleak periods of solid development where nothing visible seems to be happening. 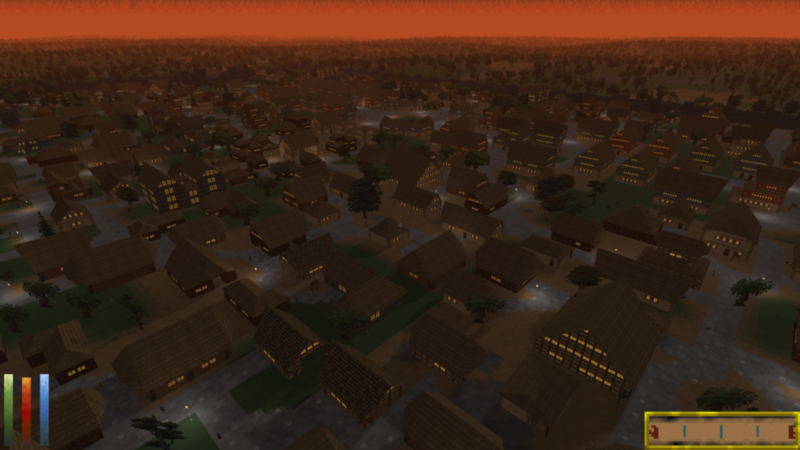 I am very excited for the future of Daggerfall Unity and the community building around it.